At 792 metres high Dove Crag is perhaps more famous for its climbing than as a mountain, a blip on the way to Fairfield but Dove Crag was actually the first fell that Wainwright wrote about. Seen here from a field near Hartsop Hall. 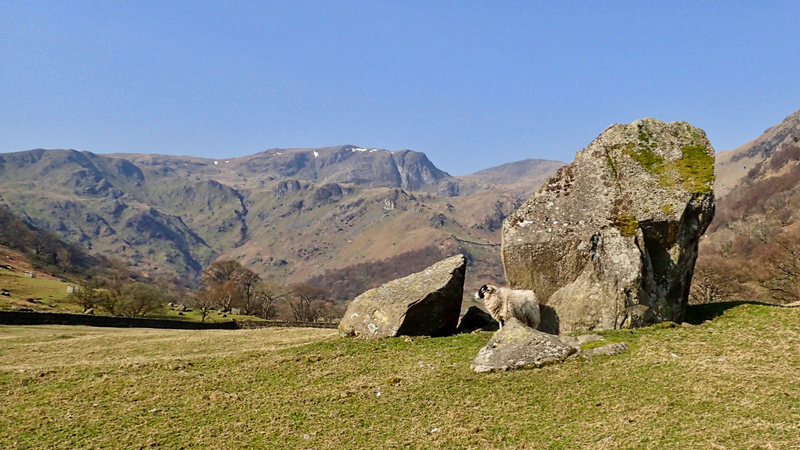 The boulder is an erratic dumped by the retreating glaciers of the last ice age and Dovedale is thought to have been the largest glacier in the Lake District, therefore, it is quite conceivable that this was one of the last boulders to be left. It stands isolated but close by several other boulders that would have been on the shore on the post-glacial Brothers Water which has since shrunk through sedimentation. What early man would have made of this natural monoliths is open to question but Iron Age man incorporated them in their settlement defences. The boulder forms part of a Romano-British settlement containing hut circles and a burial cairn. Today a determined sheep guards the stone.